WebEx is a full-featured Web Conferencing solution powered by Cisco and includes audio, video and file/screen sharing functionality for the ultimate business collaboration tool between remote locations and from any smart device. WebEx has been around since the mid-90's and was acquired by Cisco in 2007 to become part of it's collaboration portfolio. Along with GoToMeeting, WebEx Meetings is one of the most well-known, respected and established online Conferencing solutions in the market today. Various plan options are available through the WebEx Meetings solution to cover most small-to-medium sized business (SMB) needs, as well as larger corporations. A free version is available for up to 3 attendees (you plus two others). This is a great option for the small business that have 1 or 2 remote workers that need to be involved in discussions with the main office. Premium paid plans start at $24 per month ($19 per month if you sign up for the annual plan) and allows up to 8 attendees per meeting. A plan is available for up to 25 attendees for $49 per month (or $39 per month on the annual plan) and for up to 100 attendees for $89 per month ($69 per month with the annual plan). There are no limits on the number of meetings you can schedule and no limit on time. The WebEx plans are feature rich and include HD video (up to 7 video feeds simultaneously), VoIP or phone call-in audio options, and the usual file/application and desktop sharing capabilities. 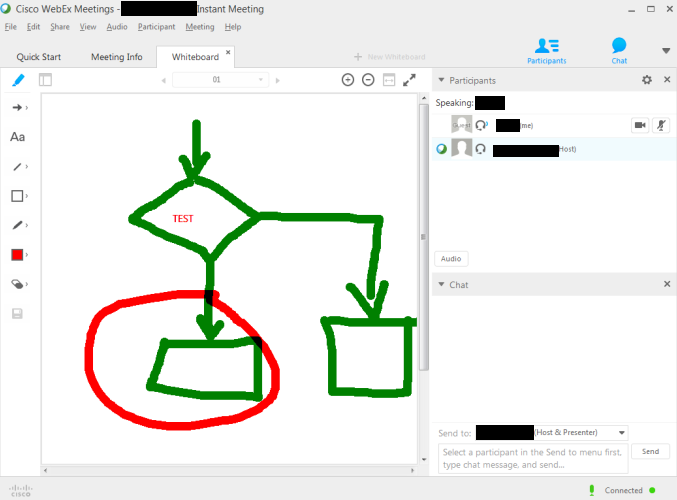 Plans also include mark-up tools and whiteboard functionality for those impromptu eureka moments or brainstorming ideas, the ability to record meetings or parts of the meeting (includes the audio, video and presentation parts), and ability to pass presenter role to any attendees in the meeting. Meetings can be password protected and you can also pass control of someones desktop to another user. Outlook integration is possible with the free plug-in, allowing you to schedule meetings from inside Outlook. You can schedule meetings or use the "Meet Now" option for those times when you just need to get the right people in a "virtual" room quickly. When you sign up for service you receive a WebEx account. You can sign into your account to schedule meetings if you dont use Outlook. A "Meeting Space" is provided for your scheduled meeting where you can upload documents and information for the meeting. A link to this space is included in your meeting invitation so all attendees can access this space before and after the meeting. This service can be used from any smart device, including desktop, laptops, tablets, and mobile devices. The mobile apps are included free as part of your plan subscription (includes iPhone, iPad, Android etc.). This solution is compatible with PC, MAC and LINUX platforms. We tested out the free version and found it to be very intuitive and easy to use. Audio was crystal clear and the video feeds were clear although not in HD in the free version. A "Call Me" feature add-on is available for a monthly fee based on a fixed number of minutes per month or as a pay-as-you-go option where you pay per minute used. This feature allows you to set up meetings that will call you when the meeting starts. There are no pass-codes or dial-in numbers needed. It also provides a toll-free dial-in number in case you need to dial in (from the US, Canada and Western Europe). Customer service is available 24/7. WebEx Meetings are delivered over the Cisco WebEx cloud, providing security (multilayer security including 128-bit SSL) and reliability (worldwide data centers). Other products/services are available including the WebEx Event Center (for events/webinars), Training Center (for hosting online training or courses) and Support Center (for providing remote support). The video feature in the free version is not HD but is clear when the feeds are minimized (not full screen). You need to log into your account online to schedule meetings unless using the Outlook integration app. The option to record during the meeting is only available to the organizer. This can also be a good thing as attendees must be informed if the meeting is being recorded. If you ever decide to cancel your services make sure you remove any files/documents you need from your meeting spaces as WebEx will delete these. Free Account: A great option for the very small business and a great price! Allows up to 3 attendees per meeting and no limit on meetings and time. Most features are included but video is non-HD. Premium 8: $24 per month with no contract, or $19 per month with annual plan sign up. Allows up to 8 attendees per meeting and includes all the available features. Premium 25: $49 per month, or $39 per month with annual plan sign up. Allows up to 25 attendees per meeting and includes all the available features. Premium 100: $89 per month, or $69 per month with annual plan sign up. Allows up to 100 attendees per meeting and includes all the available features. Call Me: This "add-on" provides an option to have your phone number called at the start of the meeting rather than entering the meeting in the typical way. The monthly rate depends on the number of minutes you want, starting at $45/mo for 500 minutes and going up to $225/mo for 3,000 minutes. Pay-as-you-go is available at 12 cents per minute. The WebEx Meetings service is a very good and solid conferencing solution which we would recommend. Feature rich, including HD video, easy to use collaboration tools such as whiteboards and sharing capabilities, recording capabilities, plus free mobile apps and more. Security and reliability are synonymous with the Cisco infrastructure providing piece of mind. The interface is intuitive and overall this solution is very easy to use. During our tests the audio was crystal clear. The free version allows you to test their platform before committing and you can trial the premium features for 14 days. Premium plans are competively priced when compared with others in the market and provide value for money. Continue down the page to view some screenshots of the free version. 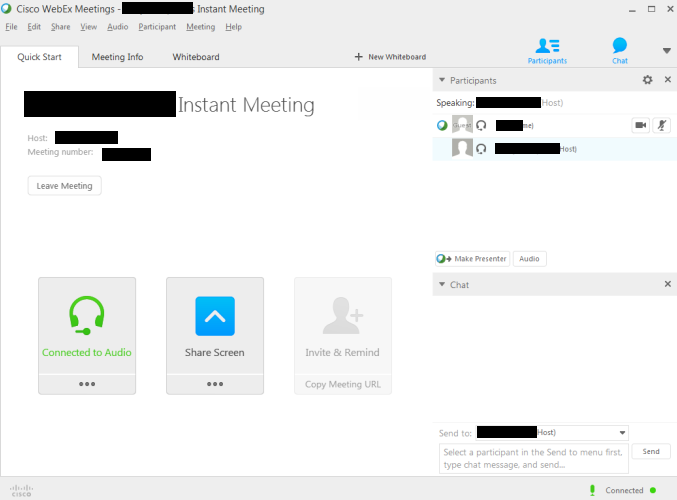 The closest competitor to WebEx is the Citrix GoToMeeting solution. See how these two heavyweights compare in our GoToMeeting versus WebEx article. You can also access our GoToMeeting Review for further reading. Here are some screenshots taken when testing the free version to give you an idea of the user interface. Figure 1 provides a view of the "start" screen, showing the audio button, the share button and invite button in the main area. The participants list and chat window are located on the right side. You can toggle your video feed and your microphone on/off by clicking on the appropriate icons to the right of your name. A "whiteboard" session (shown in Figure 3) can be initiated by simply clicking on the "+ New Whiteboard" link located towards the top area. Figure 2 shows what the presenter tool bar looks like. The meeting organizer will also have a "record" button in their tool bar. WebEx reviews are listed in chronological order. We have been very happy with this service since we started using it about 6 months ago. Its extremely easy to use and has great features. The whiteboard feature is awesome and we use it to show ideas when we brainstorm. We don't use the video option much and the audio has always been clear. Its just so easy to use. Definitely recommend it to others.